Many manufacturers have added additional gears to their transmissions and opted for smaller, turbocharged engines. With the consumer's need for torque, the manufacturers could not exactly put smaller engines in and add more gears. Ford's solution was to reduce weight by using more aluminum and plastic parts. Their all-aluminum frame has been widely advertised and reported on by news agencies; however, the bad news has never made it to light, until now. The problem with lightweight materials. Whether a hood, bumper, or frame lightweight materials such as aluminum, carbon fiber, and plastics are replacing their heavier steel counterparts. While they do reduce the overall weight of the vehicle which helps increase fuel efficiency, they pose a special problem that the industry does not want you to know. You probably know it, you just don't know you know it. Keep reading, I will explain it all. 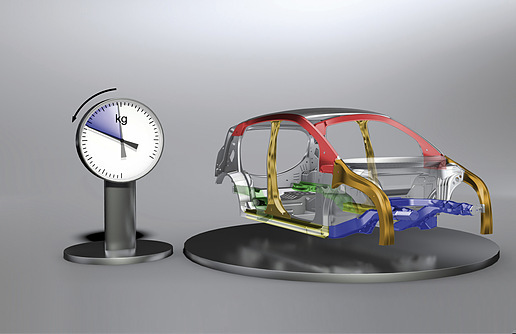 Most of the newer cars use hot stamped high strength steel (see my previous blog post for more about that) which reduces the weight and rigidity of the passenger compartment. The problem is that these sections of the vehicle can NOT be repaired (sectioned). Instead, they must be replaced. Additionally, the aluminum and plastic parts do not wear as well as their steel counterparts. Repairing them is difficult, if not impossible, and requires repair skills and knowledge which are not historically found in the average body shop. Aluminum frames cannot be "pulled" back into place when bent, instead replacement is necessary and often not even an option. Why should you care about all of this and what difference does it make? Because the repair practices are so specialized and difficult, the cost of repairs has increased substantially. The cost of repairs for an average fender bender involving a front bumper, grille, and headlamps has gone from $3,000-$5,000 (2005) to $15,000-$19,000 (2017). You might think, "I have insurance for that, who cares?" You should care. Insurance premiums have skyrocketed in the last few years, mirroring the cost of repairs. With the lack of repair parts and altered assembly methods, we can expect the cost of insurance to continue to rise, especially in the next 2-3 years. What can you do to offset the increased costs of insurance? Unfortunately, I do not have a good answer for that. Many insurance companies have rewards for employment, school enrollment, good driving, etc... Call your insurance company, compare rates, and take advantage of discounts, rebates, and rewards.